Vickie Heydon-Matterface from Brownhills Methodist Church (that’s the one by the Market in Silver Street) kindly sent me an email recently to point out that their Christmas tree festival is on Tomorrow, Friday 10th December 2010 and Saturday 11th December, when there will also be a Christmas market in full swing, including tombola, refreshments, raffle and seasonal cards and gifts. The tree festival is open on Friday from 10:00am to 3:00pm, and the Christmas market kicks off at 9:00am until 3:00pm. It’s part of the ongoing ‘Christmas Magic in Brownhills‘ series of events, so do get down there. Last week’s Christmas Fayre was good fun, and despite some rather arctic weather, was well attended. It was nice to see Brownhills relaxed with itself for a change. Also coming up we’ve got Christmas storytelling at the Parkview Centre for 5-8 year olds, that’ll be on Saturday 10th December from 11:00am to 12:00pm, and Carol Singing at Knaves Court on Monday 13th December from 6:30pm to 7:30pm – all welcome. Please support these events as some really community-spirited people are putting them on, and a good time is sure to be had by all. (edit Friday morning) I note that Kevin Simon has some pictures of the tree festival up on his blog. Looks lovely. 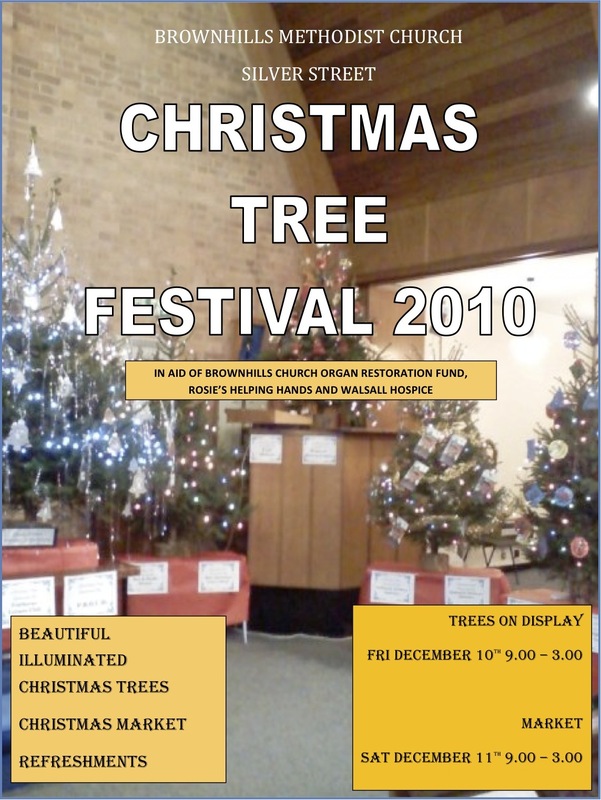 This entry was posted in Brownhills stuff, Churches, Events, Followups, Fun stuff to see and do, Local media, Reader enquiries, Shared media, Spotted whilst browsing the web and tagged Brownhills, Brownhills Christmas Market, Brownhills Market, Brownhills Methodist Church, Carol Singing, Christmas Magic in Brownhills, Christmas Storytelling, Knaves Court, Parkview Centre, Silver Street, Vickie Heydon-Matterface. Bookmark the permalink. Thats great..wish I was there to visit these events…I miss old blighty very much. I remember playing the organ in the Methodist church… (It was one day when I was there to tune the piano years ago…maybe 20 years)..Cracking instrument which made an impression.